Anyone else using Google+ on a2k yet? Thanks for resurrecting this topic. We went over this one in class. Google+ is good for a lot of stuff but here's probably the biggest thing - getting a better ranking on Google. See, the search engine really likes links that are shared here. And here's a second big thing - you can show Google verified authorship. Go here - http://www.google.com/webmasters/tools/richsnippets and you can test it. Verified authorship is lovely when a search query brings up your site. Your avatar shows up along with it. 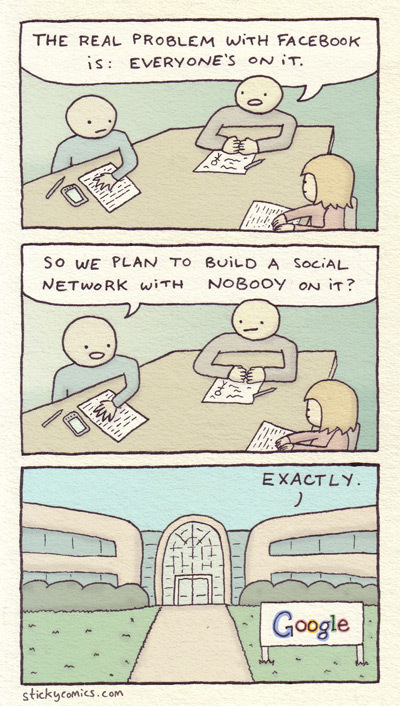 It's also useful because it's an actual social network with conversations/circles. There is more control over who can read what. And you can upload whatever. My partner's and my project is to promote a small local band. We tried MySpace, and they totally sucked! Google+ has proven to be a better venue for us because we can at least try to engage people in conversations. There's really nowhere to do that on MySpace, which currently has a strategy to not be a social network. It's not perfect (and if I sound like a commercial for Google+ it's because I blame caffeine) and there are still a lot of people who really hate it. But it's got a place and it does have value. Don't believe me? Check out Britney Spears (yes, really; we studied her marketing strategy) on both MySpace and Google+ and you tell me which network is working better for her. Didn't MySpace sort of tank about 5 years ago? Most musicians (in my extended real-life circle) don't even bother with it. Some FB it, some use G+, some use both. They tell me G+ is a marketing space, not for social networking. I might give in and listen to you on this one, Jes. Wait, that sounded wrong - I usually listen to you. Just that I had that episode of google being strongly insistent that I join goog + and I said f'm. I've found other ways to see maps, other ways to see homes of friends wanting me to see their houses now, or see the places I used to live, and so on. I admit I'm fairly internet bully corporation paranoid, at least in part because of my dummyness but also my natural reasonable wariness. MySpace is trying to come back. It's funny. When we said we wanted to promote a band for our project, everybody said, "Go to MySpace." And we did, and I couldn't for the life of me figure out why anyone would. Justin Timberlake owns a stake in it these days, and he and his group are trying to turn it around, but it seems rather dead in there. And yeah, G+ is trying to position itself as a marketing space. I think they are seeing their niche as being FB-style branding and marketing push, but with (possibly) more and better customer discussions. Certainly with better and easier message transmission granularity (a fancy way of saying it's easier to control who your stuff goes to on G+ than on FB, but that's mainly a function of FB changing its privacy settings and its opt-in/out defaults all the time). FB is often one big A/B test. one of the events I went to on Friday tried to test it out. there were two bands promoting the same event (2 separate outdoor concerts followed by an unsanctioned parade leading to a mutual outdoor concert). one group focused more on G+, the other on FB. The FB crowd ended up being close to three times the size of the G+ crowd. I personally think it was hugely skewed as the group that focused on FB has a bigger fanbase (from what I can see from the outside). In any case, a fun event with tons of music, fire spinners, dancing and symbolic destruction of winter. I still freeze re joining fb, recalcitrant re my own potential to deal with it - as two people/usenames, osso, natch, but my own name, two scenarios at once. And yeah, G+ is trying to position itself as a marketing space. That makes Google Plus sound like an enterprise network rather then a social network. No wonder I can't find any relevance in it. I feel the same way about Linkedin. Because Facebook doesn't really have great ways to sell music (or anything), other than click on this Amazon or iTunes link, if G+ can fill that void, then they'll bury MySpace for good, and will be able to grab the indie band/indie author/indie services provider niche, and possibly even take a run at eBay, Craigslist or even Angie's List. An A/B test is when a webmaster serves out 2 different versions of a page (or more), in an effort to test which one results in more sales, clicks, time on site or whatever is being measured. Users only see one version. So you might see a page where the color scheme is predominantly blue. My color scheme might be predominantly green. Or ehBeth's might have a button that Facebook (or whatever site the webmaster is testing) wants people to click on the right; tsarstepan might have that same button, and everything else is the same, but it's on the left. It is a somewhat slow and granular process because, if you change four things on a page, who's to say which one caused an increase in clicks? The button being on the left, or being yellow, or the ad copy having a bigger heading font, or the size of the product image being increased by 14%? Facebook changes their layout all the time, and they do it in waves. They are definitely monitoring user mood, whether it's the number of tickets on their Help Desk, or the positivity/negativity they use in their tweets about Facebook (this is called Social Sentiment), or their blog posts about Facebook. How many times do people click on or share an image on Facebook that says something like "Bring back the old layout on Facebook!" (Facebook is where people go to complain about Facebook). Plus they are also monitoring press mentions of them, both online and offline. It would not shock me one bit if there was at least one person employed by them, either permanently or in a contract role or through some agency, whose job at least in part consists of watching TIVO'd television shows and news stories that mention Facebook, in an effort to determine whether the overall sentiment is positive, negative, or neutral (or cannot be determined). » Anyone else using Google+ on a2k yet?